Eska one side white lined greyboard is suitable for showcards, displays and luxury packaging. The grey board is made from 100% recovered paper fibres, is totally chlorine free (TCF) and one of the most environmentally friendly choices in its product class. Eska greyboard’s inner layer and white offset lining paper are made from 100% recovered fibres (post-consumer). A totally chlorine free (TCF) bleaching method has been used for the lining paper. This makes Eska White Lined Grey board one of the most environmentally friendly choices in its product class. 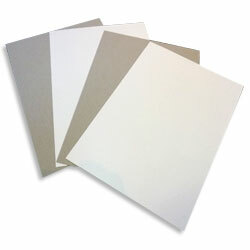 One side white lined greyboard for showcards, displays and luxury packaging. This product has been specially cut to 715x507mm. Please see notes in product details page.